Situated in Central London area, Liverpool Street is a perfect choice for any foreign traveler who wants to discover London and to have a good connection with the major transport links in the English capital during its stay. Actually, this street accommodates one of the most important British railways and Underground station ranked as the third by the number of passengers served: Liverpool Street Station. Let’s also mention that even though the location is central the accommodation prices in the area are very affordable so why not making a stop and considering what you can see around? Just note down some names of hotels where you can book a convenient room with prices starting from less than 20 GBP per night: Old Friend Hotel, Shoreditch Inn, City View Hotel London, The Bridge Hotel. Number one on the list of places that worth mentioning, with a long tradition in terms of passenger transfers starting with 1874, Liverpool Street station is a central railway terminus that accommodates millions of tourists every year. The facility is a massive construction structured on 2 levels: the Underground Station and the Railway terminus. If your place of accommodation is in the area you cannot miss this location as you will need to travel to different points in London. Shopping has always been the main occupation for tourists and Liverpool Street has plenty of shops and markets that can make anyone surpass their budget and forget about any financial constraints. Some names of shopping locations you can pay a visit to Liverpool Street or nearby are The Arcade, Charbonnel et Walker shop, Hummingbird Bakery, Old Spitalfields Market, Petticoat Lane Market. If your London visit is taking place this June 2015 let’s see how you can spend your time in an interesting manner. The Barbican Centre which is only 10 minutes walk from Liverpool Street is the host of multiple cultural events starting with theatre spectacles, exhibitions, and concerts. Let’s now have a look at some of the most interesting events for the month of June in Liverpool street area so that you can choose whatever you like. On the 2nd of June, the Barbican Centre will host an exceptional classical music event: Australia Piano Quartet, where a group of young and talented musicians will perform from Schumann, Sculthorpe and Jack Symonds’s works. If you are more into the theatre just buy a ticket for a stage comedy Waiting For Godot and it is for sure that you won’t regret it. This play will be hosted by the Barbican Centre and the tickets start from £16. According to the area, you will make the booking the prices can go up. Another great option for food lovers is the World Food market event organized by Epicurean between 2 and 5th of June 2015. This event is hosted by Devonshire Square which is located near Liverpool Street station. If you want to have your dinner at a fancy restaurant just consider the following locations: Duck & Waffle, City Social, Searcys | The Gherkin, Angler, Sushisamba, La Tagliata. And these are only a few of the best offers in Liverpool Street. Keep in mind that you have to make a reservation as you can find yourself with no seat available otherwise. 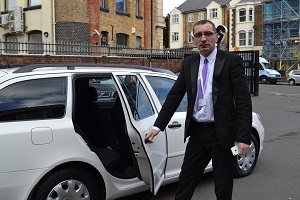 Considering you will need a ride from your arriving airport 247 Heathrow Airport Transfer will satisfy all your demands in terms of safety and comfort. For a Heathrow to Liverpool street station transfer you will pay only £47 and if you decide to register with a membership account you can have a 10% discount.